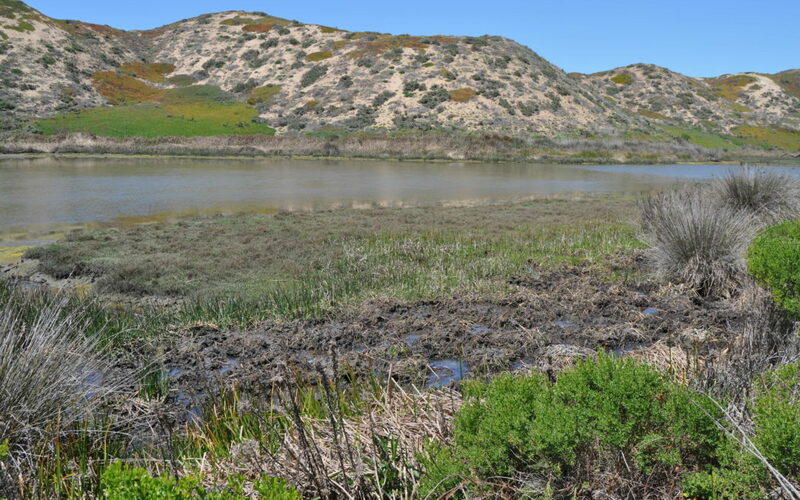 Wild pigs are again active in Morro Bay, causing damage while rooting for the tuberous reeds in the brackish freshwater seep zones close to the high tide line. This time they are at Shark Inlet. We last saw them in 2015 on both sides of the South Bay Boulevard bridge, and neither of the locations appear to have recovered. Pigs were apparently introduced into the Carmel Valley area for hunting purposes, and have since spread all over the Coast Ranges. They prefer tubers and roots, but will also eat any small wildlife they ﬁnd. In the Diablo Range, researchers found that 40 % of pigs sampled had vertebrate remains in their stomachs. Some plants, such as blue-eyed grass and blue dicks, seem to be a favorite target, but populations are refreshed when the rooting pigs disperse bulbs. Kat Anderson, our featured speaker this month, pointed out in the 1997 Journal of Ethnobotany (v. 17 (2) p. 149-169) that native peoples did exactly the same thing, harvesting a variety of bulbs and corms. Indeed, the term ‘digger’, which is now considered a derogatory term by native peoples, was used because of the digging sticks used by native bulb gatherers. 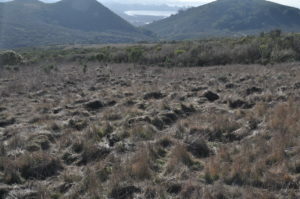 Kat points out in her article “From Tillage to Table: The Indigenous Cultivation of Geophytes for Food in California” that Allium, Brodiaea, Calochorius, Camassia, Chlorogalum, Dichelosiemma, Lilium, Perideridia, Sanicula, and Triteleia were all collected. So, in some cases, pig rooting may not always be as terrible as it looks. However to less common species such as Calochortus, impacts can be severe. Perhaps the greatest threat is damage to oak woodlands, through massive acorn predation and seedling disturbance.